A comparison study on electrical performance of Ge pMOSFETs with a GeOx passivation layer formed by ozone post oxidation (OPO) and plasma post oxidation (PPO) is performed. 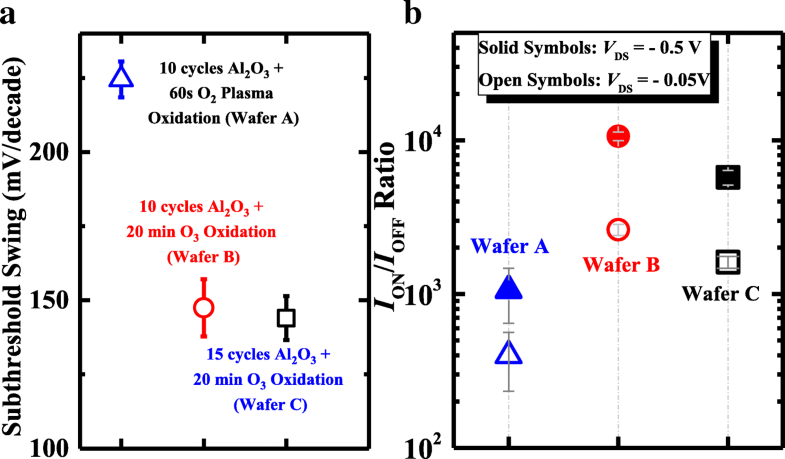 PPO and OPO were carried out on an Al2O3/n-Ge (001) substrate followed by a 5-nm HfO2 gate dielectric in situ deposited in an ALD chamber. The quality of the dielectric/Ge interface layer was characterized by X-ray photoelectron spectroscopy and transmission electron microscopy. The PPO treatment leads to a positive threshold voltage (VTH) shift and a lower ION/IOFF ratio, implying a poor interface quality. Ge pMOSFETs with OPO exhibit a higher ION/IOFF ratio (up to four orders of magnitude), improved subthreshold swing, and enhanced carrier mobility characteristics as compared with PPO devices. A thicker Al2O3 block layer in the OPO process leads to a higher mobility in Ge transistors. By comparing two different oxidation methods, the results show that the OPO is an effective way to increase the interface layer quality which is contributing to the improved effective mobility of Ge pMOSFETs. With conventional complementary metal-oxide-semiconductor (CMOS) devices approaching its physical limit, performance enhancement is hard to realize for high-speed semiconductor devices with silicon (Si) as the channel material. Replacing substrate or channel material with other material with high mobility is an imperative option. Germanium (Ge) has been considered as a promising alternative channel material owing to higher carrier mobility than that of Si. The MOSFET usually needs a high-quality oxide/semiconductor interface to reach high effective mobility. However, for quite a long history, Ge MOSFETs suffered from the high interface state density (Dit) caused by the poor thermal stability of GeO2 and dangling bonds . Thus, plenty of research has been carried out on Ge interface passivation. 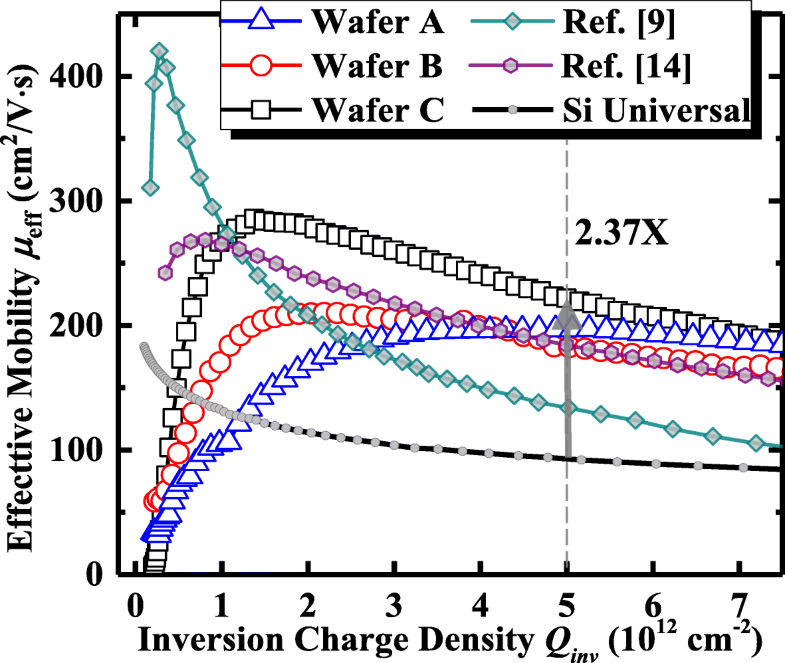 Several approaches to achieving a high-quality Ge/dielectric interface layer have been reported, such as Si passivation by uniformly depositing several Si monolayers on Ge substrate before dielectric epitaxy or self-passivation by forming GeO2 on purpose [2, 3]. In order to form a high-quality GeO2 layer, there are many oxidation processes to reduce Dit and improve thermal stability including high-pressure oxidation , ozone oxidation , H2O plasma , and electron cyclotron resonance (ECR) plasma post oxidation . 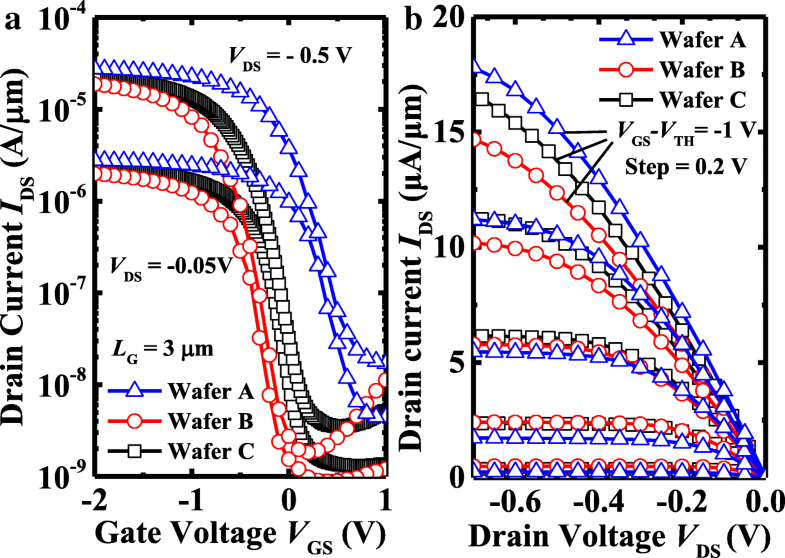 In recent years, plenty of works have been reported that high-performance Ge MOSFET can be realized by post oxidation through Al2O3/Ge interface. In 2014, a Ge CMOS inverter was realized on a Ge-on-insulator (GeOI) substrate with GeOx grown by rapid thermal annealing in pure oxygen ambient after 1 nm Al2O3 was deposited on Ge . In ref. , Ge pMOSFETs and nMOSFETs with GeOx passivation were fabricated with oxygen plasma post oxidation and temperature dependence of GeOx thickness and electrical performance were also discussed. Thermal oxidation of Ge by ozone can be performed at a lower temperature, for ozone is more reactive than oxygen . The impact of temperature on GeOx thickness grown by ozone on Ge surface was demonstrated. Ge pMOSFETs with GeOx passivation fabricated by ozone post oxidation was also reported . In this work, Ge pMOSFETs with GeOx passivation are fabricated using ozone post oxidation (OPO) and oxygen plasma post oxidation (PPO) of the Al2O3/n-Ge interface. A comparison study on the electrical performance of Ge pMOSFETs with OPO and PPO is carried out. All the processes except passivation are precisely controlled to be the same. The post oxidation was carried out after the Al2O3 block layer deposition that is different from  in which the post oxidation was after HfO2 deposition. The mobility degeneration mechanism of Coulomb and roughness scattering is investigated. The impact of the thickness of the Al2O3 block layer on device performance is also discussed. Overall, we demonstrate that OPO is a promising passivation technique for future Ge MOSFET fabrication. Ge pMOSFETs were fabricated on 4-in. n-Ge (001) wafers with a resistivity of 0.14–0.183 Ω cm. Three different passivation processes were performed, and the key process steps are shown in Fig. 1a. The wafers were cleaned by diluted HF (1:50) and deionized water for several cycles to remove the native oxide and then transferred into a plasma-enhanced atomic layer deposition PEALD (Picosun R200 Advanced) chamber immediately. Then, a thin Al2O3 film (~ 1 nm) was deposited at 300 °C with trimethylaluminium (TMA) and deionized water (H2O) as the precursors of Al and O, respectively. Because the Al2O3/GeO2 layer is too thin to have a precise oxygen atom ratio, we marked these two layers as AlOx/GeOx. PPO was performed with the Litmas remote plasma source for 60 s. An ozone generator (IN USA AC series Ozone generators) with the input oxygen flow of 750 sccm was used for the OPO treatment in 50% O3/O2 ambient. Without breaking the vacuum, 60-cycle HfO2 was then deposited on the top of AlOx/GeOx after PPO or OPO treatment at 300 °C using tetrakis dimethyl amino hafnium (TDMAHf) and H2O as the precursors of Hf and O, respectively. A 100-nm TaN was then deposited by reactive sputtering as gate metal. After gate patterning and etching, self-aligned BF2+ implantation into source/drain(S/D) regions with an energy of 20 keV and a dose of 1 × 1015 cm− 2 was carried out. A 20-nm Ni S/D metal was deposited and patterned by a lift-off process. Finally, rapid thermal annealing at 450 °C for 30 s for dopant activation and S/D ohmic contact was followed. The schematic and microscopy images of the fabricated Ge pMOSFETs are shown in Fig. 1b and c, respectively. The cross section of TaN/HfO2/AlOx/GeOx/Ge gate stack was depicted using a transmission electron microscope (TEM) to compare the impact of oxygen plasma or ozone on GeOx formation. Figure 2a and b show the cross-sectional TEM images of TaN/HfO2/AlOx/GeOx/Ge gate stack with PPO and OPO, respectively. The thickness of the amorphous HfO2 layer in both devices is 6 nm. 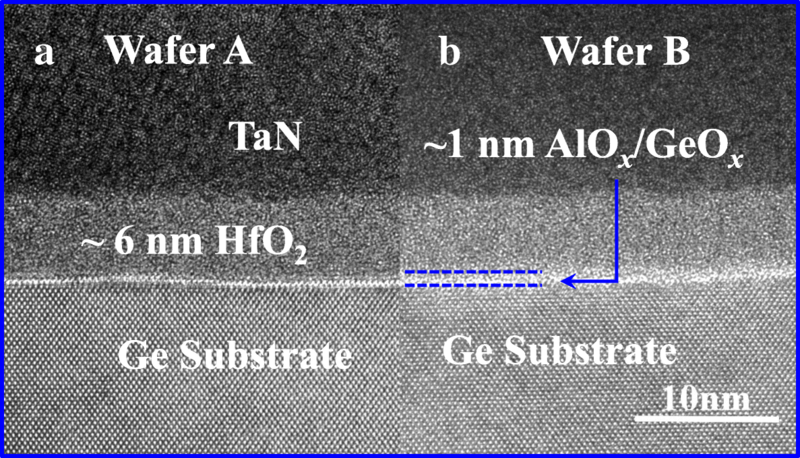 Wafer A with 60s PPO treatment have a distinct AlOx/GeOx layer between the HfO2 and Ge substrates. This AlOx/GeOx layer in wafer B formed by 20 min OPO has an untidy margin. The thickness of the GeOx layer is in accordance with the data in . The output and transfer characteristics coupled with high-frequency gate-to-source capacitance-voltage (CV) were measured by Keithley 4200-SCS. Figure 3 shows the comparison of transfer and output characteristic of Ge pMOSFETs with three different formation conditions of the AlOx/GeOx passivation layer. All the devices on various wafers have a gate length (LG) of 3 μm. Devices on wafer A exhibit a higher saturated drain current (IDS) compared to the other two wafers. But wafers B and C with OPO show a much lower OFF-state current (IOFF) compared with wafer A with PPO. It is also seen that wafers B and C with OPO worked in enhancement mode and wafer A worked in depletion mode. It is inferred that, after PPO treatment, the n-Ge surface still remains to be p-type due to the high Dit value which has been discussed in . Wafer C with a thicker Al2O3 block layer shows a positive VTH shift compared with wafer B and a higher Dit than wafer B. It is observed from the output characteristics shown in Fig. 3b that, under a low gate voltage (VGS), wafer A has a lower IDS over wafers B and C due to the less-steep subthreshold swing (SS). When the VGS increases, IDS of wafer A is getting higher in comparison with the other two devices. Therefore, from Fig. 3 and TEM images in Fig. 2, the diffusion of the AlOx/GeOx layer may suppress the IOFF, thus resulting in an improvement of passivation effects. Figure 4 summarizes the statistical results of the ION/IOFF ratio and subthreshold swing of the devices on different wafers. Ge pMOSFETs with OPO exhibit a higher ION/IOFF ratio (~ 4 orders of magnitude) and remarkably improved SS in comparison with PPO device, indicating a higher quality of the dielectric/channel interface. 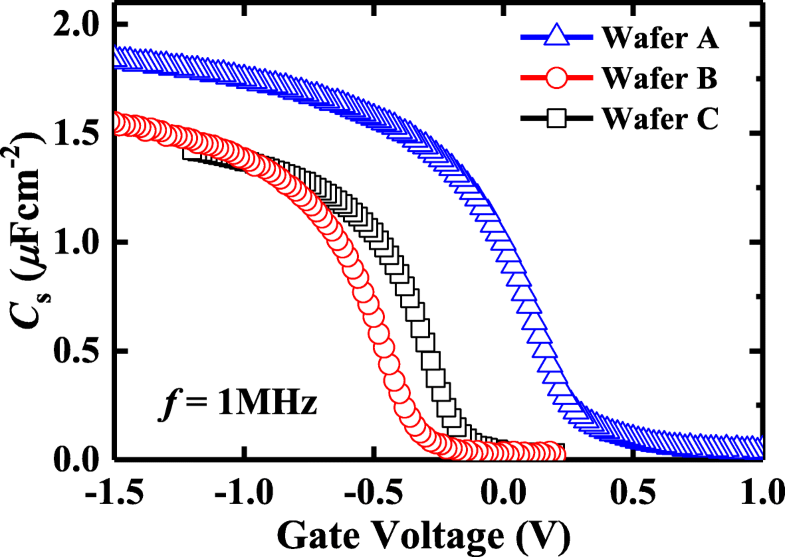 When compared with wafer B, wafer C exhibits a higher ON-state current (ION) but a lower ION/IOFF ratio. To further represent the interfacial layer quality of different post oxidation methods, wafers A, B, and C (dummy samples without HfO2 and Gate metals) were tested by X-ray photoelectron spectroscopy (XPS). XPS measurement was carried out on three post oxidation dummy samples after PPO or OPO treatment without HfO2 deposition and TaN sputtering. The stoichiometry of GeOx in Al2O3/GeO/Ge samples was investigated with a monochromatic soft Al Kα (1486.6 eV) X-ray source. Ge 3d peaks and peak-differentiating analysis are shown in Fig. 5. The Ge 3d5/2 peak of the three samples is unified at 29.7 eV, and the chemical shifts of Ge 3d3/2, Ge1+, Ge2+, Ge3+, and Ge4+ to Ge 3d5/2 are set to 0.6, 0.8, 1.8, 2.75, and 3.4 eV, respectively . In Fig. 5b, wafer A shows that after a 60s PPO, the main Ge valence in GeOx are Ge1+ and Ge3+. A similar Ge valance state distribution is observed in wafer C, and a Ge3+ component is slightly increased. In Fig. 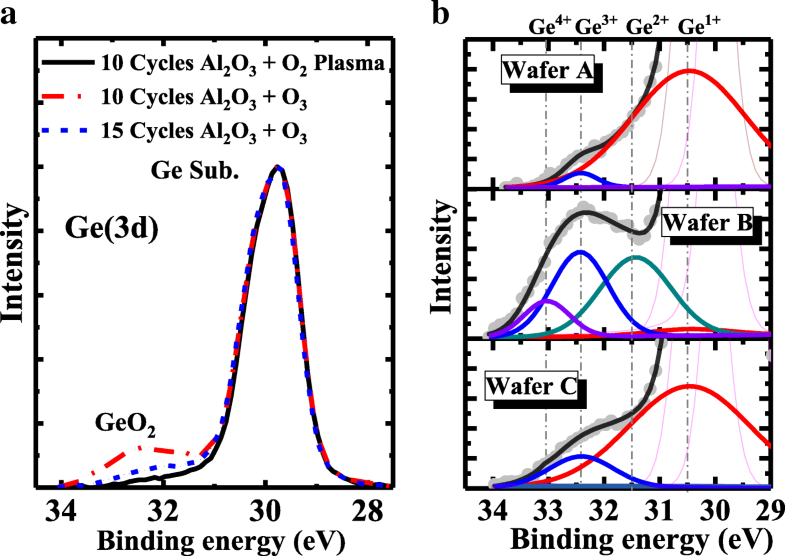 5b, wafer B shows that an OPO device with thinner (10 cycles) Al2O3 will further oxidize Ge1+ into Ge2+, Ge3+, and Ge4+, while Ge1+ is significantly reduced. The gate-to-source CV characteristics are shown in Fig. 6. From the 1-MHz CV curve, the Dit near midgap is estimated by Terman’s method , and an equivalent oxide thickness (EOT) value is also evaluated as listed in Table 1. Twenty-minute OPO (wafers B and C) results in a higher EOT as compared with PPO (wafer A). 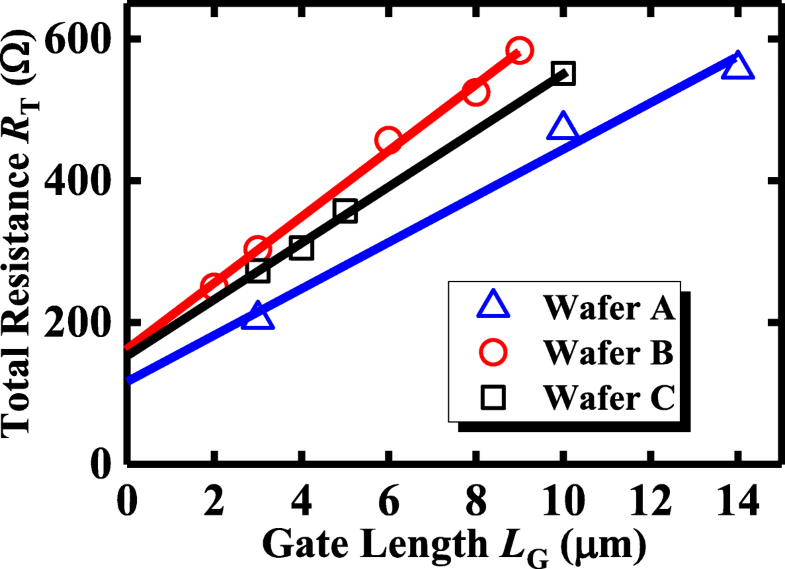 Wafer C exhibits a higher EOT over that of wafer B, due to the thicker Al2O3 as a blocking layer. It has been reported that the thickness of GeOx on a bare Ge surface in O3 ambient reaches saturation in a few minutes and the saturation thickness is dominated by temperature instead of oxidation time . So in this paper, the thickness of GeOx by ozone post oxidation is saturated after a few minutes and the left oxidation time is only for annealing. Figure 7 summarizes the total resistance (RT) versus LG of each device in this work. Here, RT is defined as VDS/IDS at VDS = 0.05 V and VGS − VTH = 1 V. The source/drain (S/D) series resistance (RSD) and channel resistance (RCH) can be extracted from the intercept and slope of the linear fitting of RT–LG lines as shown in Fig. 7. The extracted RSD and RCH results are summarized in Table 1. Figure 7 shows that the Ge pMOSFETs with PPO exhibit a lower RSD and RCH which is consistent with the capacitance results shown in Fig. 6. Effective hole mobility μeff was extracted based on a total resistance slope-based approach. In Fig. 8, we compare the μeff of our Ge pMOSFETs with PPO and OPO treatment with those of other reported Ge pMOSFETs [9, 14]. Qinv is inversion charge density in the device channel. Ge pMOSFETs with OPO exhibit a higher peak μeff compared to the devices with PPO. Wafer C with a thicker Al2O3 block layer has a higher peak hole mobility of 283 cm2/V s in comparison with wafer B with the thinner Al2O3. Wafer A with PPO exhibits a lower high-field hole μeff with the devices with OPO, which is attributed to the lower roughness scattering. But, at low field, transistors on wafer A with PPO achieve a lower μeff than the OPO devices due to the higher coulomb scattering . Only a few works about Ge pMOSFETs fabricated by ozone passivation have been reported. Here, a comparison of the key device performance between our devices and the reported Ge pMOSFETs treated with OPO [9, 14] are carried out, and the results are shown in Table 2. 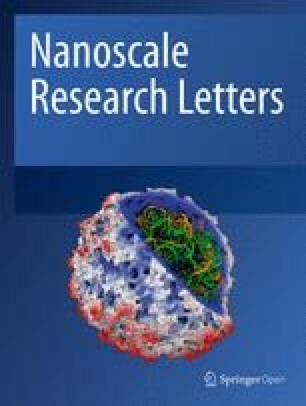 It is concluded that wafer C in this work achieves the high-field μeff enhancement and higher ION/IOFF as compared with the reported device treated with OPO. Besides, at a Qinv of 5 × 1012 cm− 2, wafer C demonstrates a 2.37× higher μeff in comparison with the Si universal mobility. The ION of wafer C is slightly lower than that in Ref. which is due to the larger EOT. Ge pMOSFETs are realized with GeOx passivation, which is formed by OPO or PPO treatment of Al2O3/n-Ge in PEALD. The OPO devices exhibit the better transfer and output characteristics, the higher ION/IOFF ratio, the improved subthreshold swing, and the higher peak μeff compared to the PPO devices. For the 15-cycle OPO process, a thicker Al2O3 layer leads to a higher EOT value and an improved μeff in devices compared to the 10-cycle case. 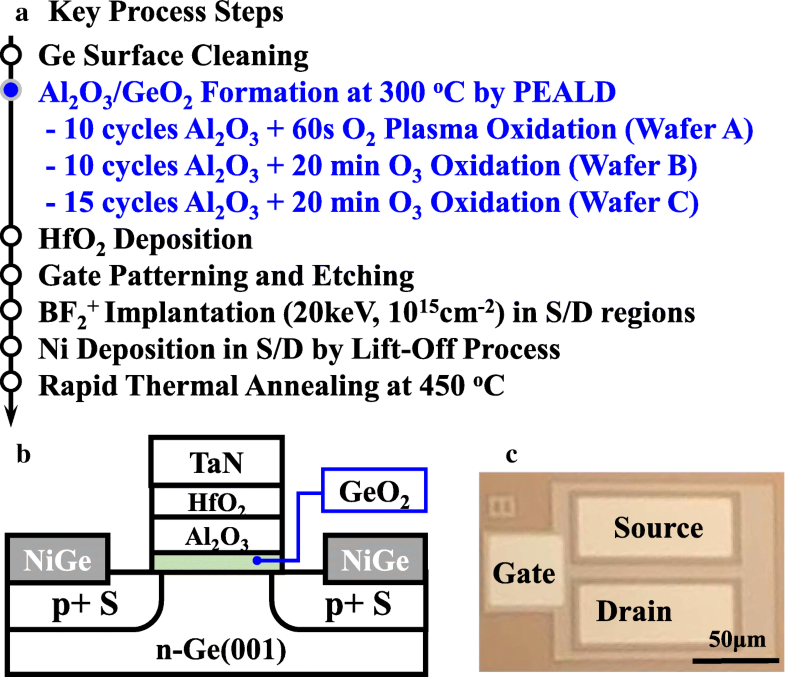 All the results in this work indicate that the OPO is an effective passivation way to achieve a high-quality Ge/dielectric interface and thus can be a promising candidate passivation technique for future Ge MOSFET fabrication. The authors acknowledge support from the National Natural Science Foundation of China under Grant No. 61534004, 61604112, 61622405, 61874081, and 61851406. YX carried out the experiments and drafted the manuscript. GQH, YL, HL, YBW, and YX designed the experiments. GQH and YL helped to revise the manuscript. JPA and YH supported the study. All the authors read and approved the final manuscript.